The 36 rock domes of Kata Tjuta and the massive, mystic red rock of Uluru (Ayers Rock) are Australia’s two best known attractions. This Best of Ayers Rock package takes you to both sights, on two separate tours, at the most awe-inspiring times of the day! The next day, you’ll return to the national park to see Kata Tjuta at sunrise. As dawn breaks over the horizon, Kata Tjuta’s rock domes dramatically change colors in the glow of the rising sun. After you’ve watched this astonishing, naturally occurring light show, you’ll be treated to an outback picnic breakfast. Listen for the sounds of outback creatures, as the Uluru-Kata Tjuta National Park is a haven for Australia’s most famous fauna. 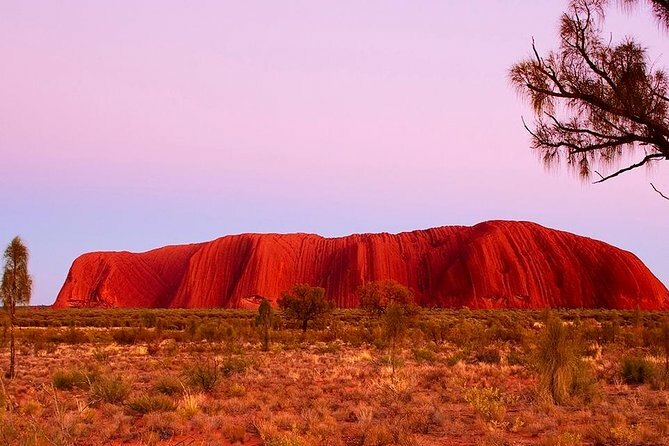 You can choose to take both tours in one day or spread them over two, and you can also schedule the tours in the opposite order, visiting Kata Tjuta first, should you choose to overnight at Ayers Rock for extra nights. The Sunset Uluru Tour with our guide Davide was excellent. Although Davide had only been working for this organization for about three months, he knew an incredible amount of details and Aborigine stories to tell us. It was a very private tour, as besides my husband and I, there was only one other lady from Adelaide. Highly enjoyable! The Sunrise Kata Tjuta Tour was also very good - but there were lots of people at the same spot. Informative and pleasant guides, keen to impart their knowledge and happy to answer questions. The small size of the groups gave an almost personal feel to the two tours. Though the sunset itself was not notable even though it yielded some good photos the setting, the guide and the light snack were very good. Gary was an excellent guide providing time for questions, informative history of the region, and an appreciation of Uluru region: a real professional. We like small groups and the van was very comfortable. In the morning the weather brought excitement and uniqueness to the tour. While walking at Kata Tjuta there was a downpour that brought waterfalls from all parts of the domes and formed streams that became rivers in moments. Some people walked to the end, a few turned back and either waded through or made their way on the uneven rocks in the stream. As our energetic, helpful guide, Francesca, said 99 of the visitors see the colors of a bright sky and dry rocks but we were lucky to experience the unusual. Before the rain we enjoyed a stop to see the rocks and a good breakfast offering opportunity to chat with others and the guide. I recommend these two tours and encourage everyone to be open to whatever nature provides. Wally was a fantastic tour guide. His narrative about the formations, the history and the Anangu people was absolutely enthralling. The small group enjoyed interesting tours by friendly and knowledgeable guides who took time to explain the local botany, history, folklore and traditions. Experienced and professional company and a wonderful experience. I highly recommend the small group tours. Very enjoyable tour! This is one of the most unique places on Earth so take some time to enjoy the sunset in this magical place. The food was just okay though. Really enjoyable drive/walk around the rock. Our guide, Shannon, was a wee bit heavy-handed and pedantic when answering questions - but quite knowledgeable. The light snack was bread and oil...light is right!!! But a truly beautiful experience overall.